With the cruise lines constantly adding and improving facilities for kids, families have more options than ever for vacations at sea. When choosing your cruise, price is an important factor, but you’ll also want to make sure the sailing you pick has programs that will keep your kids happy, be they toddlers or teens. With the right mix of activities, parents and kids alike can enjoy time together and have the freedom to participate in activities separately. To help you begin your cruise search, we’ve put together a list of cruise lines that offer affordable fares and quality amenities and programming for kids and teens. Our top choices are Disney Cruise Line, Royal Caribbean, Princess, Carnival, and Norwegian Cruise Line. With Disney at the helm, it’s no surprise that this cruise line was designed with kids in mind. As many as 50 kids’ counselors are onboard each ship, running day and evening activities for five different age groups for kids three to 17 years old. Examples of the line’s imaginative kids’ programs include Mouseketeer training for kids ages three to seven and science experiments in the Apprentice’s Workshop for kids ages eight to nine. Teens can join in activities like animation workshops and hang out in a private lounge and Internet cafe. Parents are given beepers so that they can stay in touch with their children throughout the day while enjoying adult-exclusive offerings such as spa treatments, wine tastings, and cooking demonstrations. Disney is also one of the few lines to offer discounted rates for kids staying as third, fourth, and fifth passengers in their parents’ room. On three-night Bahamas cruises, for example, extra-person rates start at $99 for kids under three and $229 for kids three to 12. Plus, adults may be able to save with sale fares, which Disney releases every week. Currently, adults can sail for as little as $359 per person on three-night sailings. To learn more about these cruises, visit the Disney Cruise Line website. 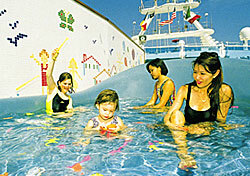 With onboard facilities like rock-climbing walls and ice-skating rinks, kids and adults alike will find it hard to be bored on Royal Caribbean ships, particularly its huge Voyager-class vessels. For kids ages three to 17, the line offers its award-winning Adventure Ocean Youth program, which is divided into three age groups for kids and two for teens. Younger kids can enjoy fully supervised activities that focus on science, art, games, or water activities, while teens are given more freedom and can choose to participate in organized activities, or simply relax and mingle with other teenagers. A supervised teen center is open until 2 a.m. every night. Plus, on certain evenings, kids can eat dinner with the youth staff so that adults can have more time alone. Royal Caribbean does not have children’s fares, but does offer reduced third and fourth passenger rates that vary by sailing. To find a list of current specials, go to the Royal Caribbean website and click on “Hot Deals.” Or, visit the SmarterTravel.com cruise section. This premium cruise line is a good option for families that expect a high level of quality and service and a kid-friendly atmosphere. Princess offers special kids’ facilities and activities on most ships, excluding the Royal, Tahitian, and Pacific Princess, which only have kids’ programs when 20 or more children are sailing. The other ships regularly feature activities for kids ages three to 12 such as scavenger hunts, galley tours, and pajama parties, plus fully equipped youth centers. Teens ages 13 to 17 have access to their own teen center stocked with video games, movies, and more, plus a teens-only Jacuzzi and sun deck. Kids and teens can also take part in special dinner evenings, and, on select cruises, interactive science and marine biology programs with the California Science Center and the National Wildlife Federation. Although Princess does not offer discounted rates for kids, it does have lower rates for all third and fourth passengers staying in a stateroom with two paying adults. These fares start as low as $199 per person. To find other special offers, visit the Princess website or the SmarterTravel.com cruise section. With low rates, a wide range of itineraries, and onboard amenities and services for all ages, Carnival is an attractive choice for many families. Plus, parents with younger children should consider Carnival, as it is one of few lines with programs for kids as young as two, and potty training is not a requirement. Kids up to age 15 can participate in counselor-led programs through Camp Carnival, which offers activities such as talent shows, arts and crafts, cookie decorating, pizza parties, and trivia. Teens can also join in nightly dance socials and teen-exclusive shore excursions. Carnival does not have child rates, but does offer reduced third, fourth, and fifth person rates for kids staying in a room with two adults. Carnival generally has lower rates compared to other cruise lines, and it also offers regular specials, which you can find on the Carnival website or the SmarterTravel.com cruise section. If flexibility and affordable fares are your family’s top priorities, Norwegian may be right for you. All NCL sailings feature Freestyle Cruising, a meal program that allows guests to dine whenever and wherever they want and wear what they want. This way you and your kids can eat when you’re ready and won’t have to rush through activities to make a designated mealtime. Onboard NCL, kids ages two to 17 can participate in the Kid’s and Teen’s Crew programs. Activities may include arts and crafts, pizza making, and treasure hunts for children, and dances, movies, and contests for teens. NCL does not have child fares, but does discount third and fourth passengers staying in a room with two paying adults. Visit the Norwegian Cruise Line website to find weekly cruise specials. Currently, you’ll find fares as low as $179 per person.